Robin Sylvester, Billy Broussard’s former attorney, asserts 14th JDC’s “crooked judges” as factor in withdrawal from Broussard’s case. Robin Sylvester, former legal counsel (along with Attorney General Jeff Landry) for contractor Billy Broussard. After contractor Billy Broussard was stiffed for an amount he alleges is nearly $1,150,000 for cleanup of Indian Bayou in the aftermath of Hurricane Rita, he employed the Galloway, Johnson, et. al. law firm to sue the Gravity District 8 of Ward 1 in Calcasieu Parish over its failure to remit payment to him as he alleges it owed him. The case was assigned to 14th Judicial District Judge David Ritchie. The case was dismissed after Ritchie granted a Motion for Summary Judgment, which is a motion filed by one side (the Drainage District in this instance) asserting that there are no issues of material fact and therefore the case should be ruled from the bench in favor of the moving party. Such motions may be filed by either side anytime after an answer is filed by the defendant. Landry served as counsel for Broussard prior to being elected as a U. S. Congressman, but at the time Broussard made his retort to Ritchie, Landry was no longer involved in the case. Nevertheless, Ritchie contended that Landry filed an “illegal lien” during the time he was active on the case. Even though Landry was no longer on the case, Ritchie nevertheless availed himself of the opportunity to take a pop shot at Landry’s legal skills. At the time Broussard was arguing before Ritchie and the pop shot against Landry was uttered, Landry was running for Attorney General (hence Broussard’s quick-witted response back to Ritchie). Subscribers will likely recall that Landry was nudged out of Congress through redistricting when Louisiana lost a seat after the 2010 Census, and Landry and former Congressman Charles Boustany were forced to run against one another. Boustany defeated Landry in that battle. Broussard, dejected and demoralized, began a quest to ascertain how the case could have possibly been lost based upon the facts he unequivocally alleges transpired. Though his education level is limited to the eighth grade, his sheer grit and determination to demonstrate what transpired has been unlike anything Sound Off Louisiana founder Robert Burns, who is an inactive CPA and former fraud investigator with the Federal Government, has ever seen in his life. Broussard’s quest led him to make numerous public records requests of the Drainage District and the Calcasieu Parish Police Jury (CPPJ). What he uncovered from many of those requests left him in stunned disbelief. He uncovered what he alleges was an organized conspiracy between CPPJ officials (most notably Kelly Fontenot, who is the Business Analyst and Fraud Analyst with the CPPJ) and FEMA monitor Daniel Kennedy and others to defraud FEMA by falsely representing debris which was ineligible for reimbursement as being eligible. Only debris caused by Hurricane Rita should have been eligible, and logs and trees which had been submerged for years or decades, commonly referred to as “sinker logs,” are ineligible. That debris, in contrast to debris uprooted and knocked into the Bayou, should have been the responsibility of the District to remove as part of routine maintenance of the Bayou. 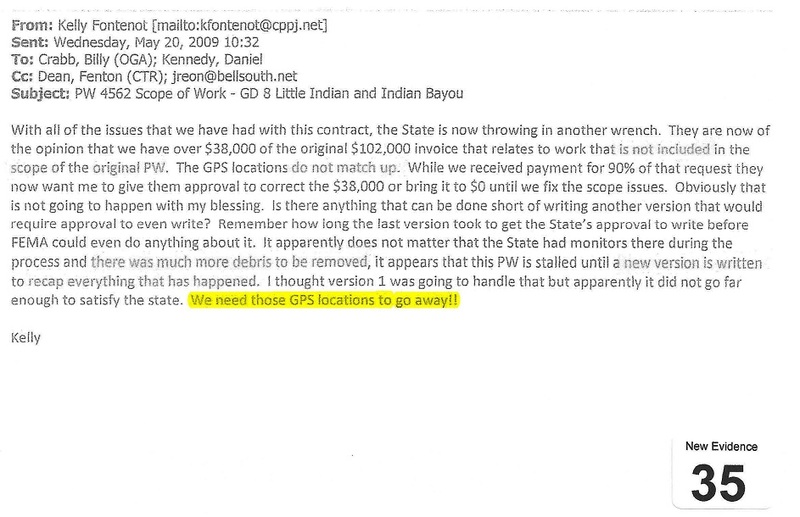 Broussard’s public records requests and investigative activities uncovered items such as an email from Fontenot to Kennedy point-blank saying, “We need those GPS locations to go away.” Kennedy, whom Broussard has stated lives in a neighborhood off of Indian Bayou, may have had a vested interest in having the Bayou cleared. Broussard further indicates that Kennedy’s home and/or neighborhood has experienced past flooding as a result of the Drainage District’s historical failure to maintain the Bayou. 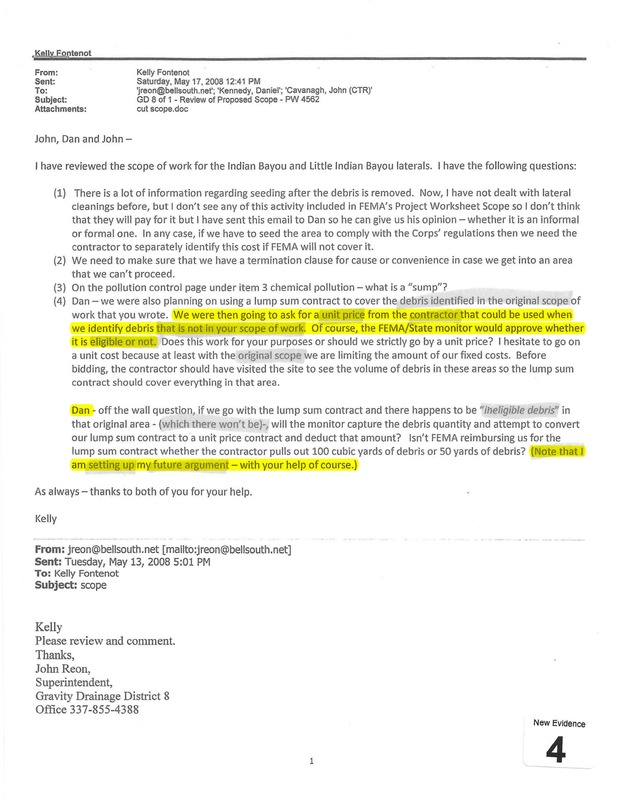 Broussard also uncovered another email (again with Kennedy a recipient) wherein Fontenot bragged that she was “setting up my future argument” regarding debris which FEMA may subsequently deem ineligible to be made eligible. In that email, she also stated that “FEMA/State Monitor would approve whether it is eligible or not,” which is precisely the representation that Broussard contends a GOHSEP representative, Kirk Harmon, made to him! Broussard believes strongly that the emails demonstrate that Fontenot “committed perjury” on the witness stand in court because, the preceding email notwithstanding, she stated under oath that she had “no knowledge the District was picking up ineligible debris” notwithstanding the clear evidence that Broussard uncovered demonstrating evidence to the contrary in the email linked in the previous paragraph (i.e. that ineligible debris was virtually certain to be picked up). 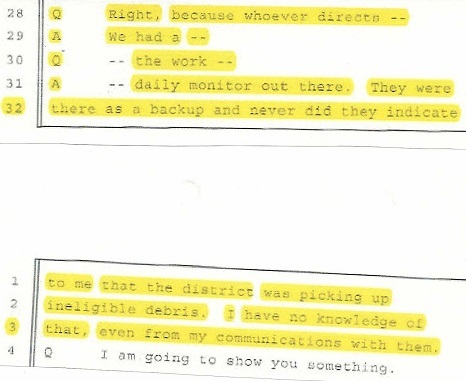 Broussard contends that collusion transpired by the submission of documentation that falsely represented that debris was removed from approved GPS sites when, in reality, he contends (actually emphatically swears) that the debris was NOT from approved GPS sites but instead was removed from sites that were located outside of the entire map of FEMA-approved GPS sites and even beyond the U. S. Army Corps of Engineers’ wetland permit! Broussard contends that it was Drainage District employees who removed that debris and that false representations were made to FEMA that the debris was removed from approved GPS sites. Broussard also contends that FEMA payments meant to go to him from debris he removed between GPS-approved sites (but still on the map of approved sites) which were received by the Drainage District after FEMA formally approved payments for that debris were instead redirected and used to pay its own workers for the work he references that he states was outside of the entire map of FEMA-approved GPS sites. Obviously, if his allegations are true, that’s clear-cut fraud perpetrated against FEMA! Basically, Broussard indicates the Drainage District appears to have been willing to exploit Hurricane Rita to transfer its own past obligation to maintain the Bayou on to taxpayers across the nation by having FEMA pay for the Bayou’s cleanup as part of Hurricane Rita recovery. Apparently, Sam Gabb, attorney for the CPPJ, and Rusty Stutes, attorney for the Drainage District, agreed with Fontenot that Broussard, through his public records requests, may have gotten a little too close to home, so to speak. Accordingly, when Fontenot complained to Stutes about Broussard’s public records requests, Stutes fired off a letter dated February 15, 2015 threatening Broussard with “contacting the FBI” and “supplying them with fraudulent documents” which Stutes asserts Broussard supplied during the trial. Undeterred by Stutes’ FBI threat, Broussard continued with his public records requests. Accordingly, Stutes’ paralegal, Kim Bienvenu, on February 18, 2015, sent Broussard an email placing him on notice to expect a filing for injunctive relief prohibiting him from seeking any further public records or even speaking with members of the Drainage District or the CPPJ. True to Bienvenu’s word, Stutes, on March 23, 2015, filed the Motion for the Injunctive Relief that Bienvenu referenced. In one of the most unbelievable acts Burns has ever seen a judge make, Ritchie signed the judgment, and the restraining order became effective March 23, 2015 and remains in effect to this day! It’s worth noting that, despite this filing being a brand new action, Stutes and Gabb chose to file the Motion under the old case file, which is one which had been fully adjudicated. Perhaps they wanted to ensure they drew the same fine, upstanding Judge (Ritchie) who was so complimentary of Attorney General Jeff Landry’s legal skills. Once Burns became involved in delving into these matters, he sent off an email to Gabb and Stutes dated February 21, 2017, asking how such a measure could be filed on a closed case. Burns also indicated in the email that he’d spoken with one CPPJ Member, Hal McMillan, an auctioneer whom Burns knows from his auctioneering days, and that McMillan had no clue any such restraining order had ever been filed, nor was he aware he was prohibited from speaking with Broussard. Having reviewed the official minutes of the CPPJ for the timeframe of the restraining order, Burns could locate no vote of the body to issue the restraining order. Accordingly, on April 25, 2018, Burns made a public records request to examine the legal invoices of Gabb and Stutes. Gabb responded indicating that he “did not bill” the CPPJ for his services entailing the restraining order. Stutes became openly defiant with Burns in much the same manner he’d been with Broussard. He sent Burns a letter indicating that the invoices would not be provided. He stated as his rationale that the invoices “contain writings which reflect the mental impressions and legal theories formulated by my office.” He concluded his correspondence to Burns by citing LA R. S. 44.1(c) as his justification for the denial. Broussard contends that all of the damning documents he has obtained were withheld from his attorneys during his original case’s discovery phase. Upon him obtaining them, he visited with Sylvester (his attorney who worked with Landry and about whom Ritchie’s pop-shot commentary was apparently equally applicable). Broussard indicated that she was impressed enough to enter into a contingency contract to file a brand new cause of action against the Drainage District and the CPPJ with Broussard which was executed on April 4, 2017. Toward the summer of 2018, Sylvester filed a Motion under the same previous suit seeking to have the restraining order against Broussard lifted. By that time, according to Broussard, Sylvester, who had broken off from Galloway, Johnson, et. al. and formed her own law firm, was far more pre-occupied with a contract she’d been awarded entailing representation for a joint venture surrounding Southern University’s medical marijuana operations. That venture experienced difficulties, and a new operator was named on November 12, 2018. As a result of him sensing that Sylvester was backing away from the aggression she initially displayed upon them signing the April 4, 2017 contract, Broussard scheduled a meeting on August 8, 2018 with New Orleans attorney William Most. Broussard sought for Most to work with Sylvester in providing backup support since his specialty is defending citizens’ Constitutional rights. Broussard researched past cases entailing Most and viewed Most to be a bulldog with little fear of local politics in initiating his litigation filings. Also, Broussard’s ultimate goal was to file any new action in Federal Court, and Most’s experience appeared to be almost exclusively confined to Federal Court. Sylvester was not exactly pleased with the introduction of Most into the equation. Broussard pushed the envelope to the max with Sylvester as an October 25, 2018 date approached for a court hearing for her to get the restraining order lifted. He fired off this email on October 4, 2018 to her indicating his desire for Fontenot to be subpoenaed for the upcoming hearing and also basically dressing Sylvester down for what he perceived as her new-found timidity regarding pursuing his claim for damages. 6-minue highlight of phone call between Broussard and this then-attorney Robin Sylvester (CLICK HERE for the full 16-minute phone call). True to her word, Sylvester filed a motion to withdraw as counsel, resulting in yet another body slam for Broussard in his decade-long quest, but at least he got Sylvester to open up about her feelings about 14th JDC judges!